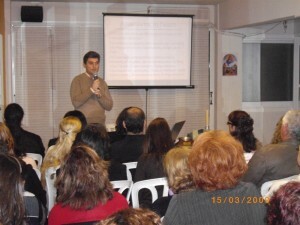 A course night at the Cyprus center in 2009. In this topic, Belsebuub writes about how important an orderly life is for spiritual development. Creating a framework around spiritual practice is an effective way to do this. Order in the psyche is created with the intelligence of consciousness. It is the result of seeing what is within, being aware and eliminating the egos, this is done at each moment, it is vital to observe, to watch what is happening within in the five inferior centres and to be aware so that then consciousness manifests and you get out of the mess of the egos. While external order arises naturally from internal order, Belsebuub writes that it’s important to make an effort to bring about order in everyday life to provide an additional boost to the efforts to acquire self-knowledge efforts. Self-remembrance is vital to be successful esoterically, it is only in those moments when you remember to do it that an inner work actually takes place, if you consider how often this happens and for how many moments through the day, then you will get some idea of how much you are actually working towards self-knowledge. Belsebuub explains how easy it is to fall into fascination. He states that not only is a decision to go against the force of fascination needed, but also that a continuous effort to see the egos and to not go along with them is required to break free of it. He states that there is a lot of pleasure in fascination and that it is like a trap that catches a person and then leads them on to other egos. He uses the analogy of bait on a hook when fishing. If a person takes the bait of the egos they can become hooked on events, and once fascinated the egos then feed on a person’s energies. Belsebuub reveals that there are many such traps in life like this, such as thinking one has to be nice to someone and therefore cannot be aware, thinking one is in a rush and doesn’t have time to be aware, and so on. Belsebuub writes about the concept of a “center of gravity” which is the main thing that a person’s life revolves around, for example a footballer obsessed with the sport and spending all their time, energy, and drive in it, or a stockbroker obsessed with making money. He writes that while these things are often a sign of a fulfilling life for many people, for self-knowledge and the esoteric work to be a success it needs to become the centre of gravity in one’s life. The way to do this is to shift one’s lifestyle towards spiritual development and to have a discipline with the exercises in order to make them work, he states. The forces of daily life one has to struggle against are immense, to defeat them, one must really know the esoteric work, and to base one’s life around it, making it the most important thing that you do in a day. To be fascinated with the things of the world and to forget about the development of one’s consciousness is to waste one’s life. A diary can be a useful tool for creating order and direction in everyday life, Belsebuub writes in this section. He states a diary can be used not only as a reminder but also to help one monitor how they spend their day in terms of spiritual development. Filling it out can take place either in the morning or evening, and can include all the tasks of the day as well as spiritual exercises, he writes. Listing activities in order of importance can ensure the most important things get done, Belsebuub states, and having them listed can help with not having to be constantly thinking about what to do next or needing to rush to get things done. For inner change to be the priority, he writes that listing self-knowledge exercises should encompass a clear goal too, with the main goal as being aware in whatever tasks are being done so that the events of life are used for inner change. It is up to you what you do with it, you may keep it as intellectual information, in which case it will have very little impact upon your life, you could apply it occasionally here and there but this will not bring about a revolutionary change. Belsebuub states that a big effort is needed to apply the techniques given in order to become more spiritual and bring about real change. Belsebuub finishes with listing all the exercises given throughout the course: observation, remembering dreams, retrospection, and keeping a diary. He explains reaching states of peace and happiness requires a lot of understanding and correcting oneself. For the last exercise of the course, Belsebuub gives the exercise of self-remembrance. He states that this is a remembering to be aware and observe oneself. Having the centre of gravity around the spiritual work greatly helps self-remembrance, Belsebuub writes. He gives two helpful ways to encourage self-remembrance. The first is creating three anchor points throughout the day, such as washing, eating, and putting shoes on, where the time is dedicated to being fully aware and observing. By practicing this, he states that one can be reminded to focus on self-remembrance throughout the day. The second method Belsebuub gives is going for at least one walk a day. In these walks, Belsebuub writes to practice being aware and observing within, trying to become clear at every moment. He states that walking in a safe place in nature can be pleasant and can also allow a perception of beauty in a natural environment. Pritchard, Mark. “Week 9: Order in Life.” Searching Within: A 9 Week Course. 2001. An online course published on the website www.mysticweb.org.